Running a successful retail store is challenging and demanding work. It requires hiring and guiding staff, managing inventory, handling finances, and marketing your wares. There are a number of resources available to improve at retail management, but there also are some broader areas where focus is needed. These include customers, your staff, and day-to-day responsibilities. Customers are the lifeblood of your retail business and everything from store design to staff training must center on satisfying those customers. In this age of social media, good and bad experiences are shared widely, and you want the buzz to be all positive. Customers need to be the foundation for everything you do in your retail business. It is their needs and desires you are aiming to meet with your products and services. By allowing the wishes of your customers to drive what you are offering, you can be confident that you are providing goods and services that are in demand. This approach also must be passed along to your staff. You want your store to be one where customers feel like your staff is a valuable resource to help them find what they want. No one wants to walk into a store and be made to feel like she is interrupting the work of the employees. Customers should feel like they are the focus of that work. 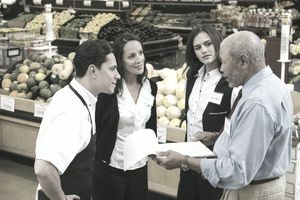 Training supervisors: Your top employees should know how to handle all situations, but training should not stop with them. Identify lower level employees potential to be supervisors one day and bring them along slowly by adding responsibilities. Get employees involved: Your staff wants to feel like it is doing more than just following directions. They're on the sales floor and dealing with customers, so make sure they know that gives them valuable insight about your business that you want to hear. Listen: Be available and take to heart what your customers and employees are telling you. Provide positive feedback: Employees want to know when they are doing a good job. Even if it is something small, remember to let staff members know when they have made a difference. Start strong: When you start strong, you don't have to play catch-up. Whether it is a new project, a marketing push, or a new or revised product or service, be sure you commit enough time to planning and training your staff, so you're not wasting time and resources correcting mistakes on the fly. Understand the bottom line: If you're running your own retail business, you might not necessarily have an extensive background in the financial end of the business world. There are a lot of things you can do to stay abreast of current and relative topics, including finding a mentor, taking classes, and attending relevant seminars. Competition from the big box stores, online retailers, and speciality shops is a fact of life in the world of retail management. The stores that will survive and thrive create unique experiences for their customers by hiring, developing, and supporting great staff members. The managers of these stores think like strategists and execute on initiatives with the precision of great project managers. Armed with the passion to succeed and the management insights to navigate the challenges of people, teams, projects, customers, staff and competition, your odds of success increase tremendously. Is New Employee Training Worth It?